Match this reversible microfiber sofa cover to suit your mood and décor. Reversing from chocolate on one side to burgundy on the other, it provides two great looks in one! 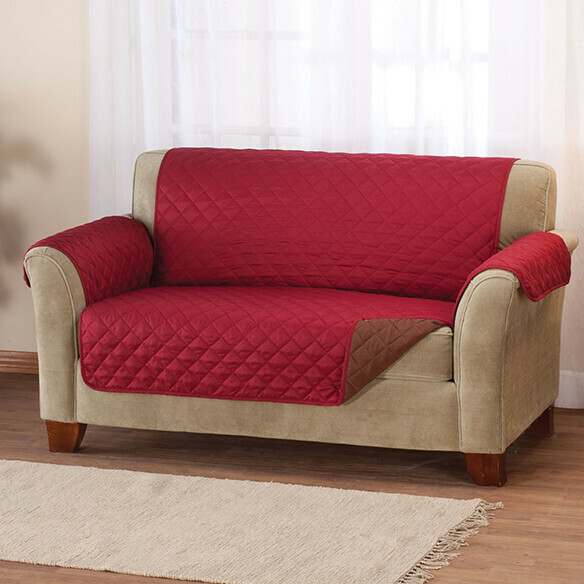 Quilted microfiber couch cover adds soft comfort to your sofa as it repels liquids to protect against spills, stains and everyday mishaps. Care is easy, too — when it's time to freshen up, simply toss in the wash. Furniture cover's extra-long back helps ensure full coverage that stays in place. Seat measures 36 1/2"L x 68"W, back is 39"L x 68"W. 100% polyester. Machine wash. Imported. For protection from any unwanted accidents. For a friend, good price. Because of my pets. Easier to take off to wash then put back on.